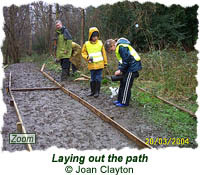 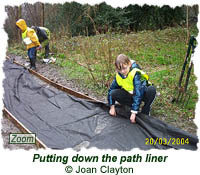 More path construction was carried out in the Woods on the Action Morning held 20th March 2004. 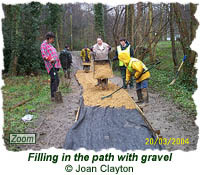 Despite the wet weather a determined group of children and grown-ups moved mountains of gravel to create a whole new section of path. 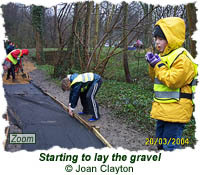 The children in the pictures below can be seen wearing new fluorescent safety jackets bought with money from the Leeds Children's Fund. 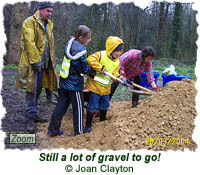 This money was also used to buy child-sized gloves, litter pickers and other equipment for youngsters wanting to join in with Action Day activities. 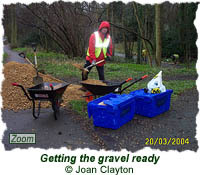 As always, all the necessary equipment (including wood, gravel and other construction material, litter picking claws, rubbish bags, gloves and spades) was supplied by the Friends to all volunteers who came.